– Huge news for Todd Brisket, as the new DuckTales is on the schedule for a Summer 2017 release! Read more at Entertainment Weekly, and listen to our show on the vidya game here! – Cinemassacre (the site of the Angry Video Game Nerd) had a viral video this week, as Mike Matei recreated the Teenage Mutant Ninja Turtles theme in Mario Paint. Check out the cool video here! – Russ Frushtick and Justin McElroy of Polygon have a cool video on the tangled history and development of Super Mario Bros. 2. We also covered SMB2 on a past show, by the way. – On Polygon and other sites, Crash Bandicoot is coming back in remastered form, for the PS4! Check out our past show on ole Crash here. – Unfortunately, Konami has sent a cease-and-desist to Dejawolfs, which was developing a remake of Castlevania in the Unreal engine. You can read the story on Siliconera here. And reminder! We covered Castlevania on a past show. – From Variety, Sega has optioned a bunch of its titles for film and television adaptations, starting with Altered Beast and Streets of Rage. And speaking of Sega selling off its merchandising rights, it has also partnered with Build-A-Bear. – Nintendo Everything has a translation of a Japanese book about The Legend of Zelda series, which reveals that a sequel to Wind Waker was canned for Twilight Princess. – Geeks of Doom has a positive review of Art of Atari, a cool book full of Atari art. – On December 9, 1997, Quake II came out for the PC. It was the online standard for a couple years of deathmatching, until Unreal Tournament and eventually Half-Life came out. – Persona 4 came out for the PS2 on December 9, 2008. It’s a hella good RPG by Atlus, and the fifth installment is due out on April 4, if it’s not delayed again. – From Ryan Divish and Geoff Baker of The Seattle Times, Nintendo is selling its majority stake in the Seattle Mariners. The valuation is $1.4 billion, and a follow-up story on how the deal was struck is here. The initial purchase price? Around $100 million, according to a January 1992 New York Times article by Lawrence Malkin. – Kotaku has an excerpt from Alyse Knorr’s book on the making of Super Mario Bros. 3, and it’s an awesome read! Check it out here. – Now out: Sega 3D Classics Collection, for the Nintendo 3DS. Games include Power Drift, Puyo Puyo 2, Fantasy Zone II and II W, Sonic the Hedgehog, Thunder Blade, Galaxy Force II, Altered Beast and Maze Walker. – Pretty much every site on the ole Internet had a piece about the new NES adapter that lets you use some modern controllers. – Nintendo has a Humble Bundle available until May. Highlights include Retro City Rampage and Citizens of Earth. – Historically, nothing prominent has come out on April 28, so… On April 29, 1998, Tekken 3 came out for the PlayStation. Released by Namco, it’s considered one of the absolute best games for the system, and one of the best fighting games of all-time. – A little game called Grand Theft Auto IV came out on April 29, 2008. It made a bazillion dollars for Rockstar. – Similarly: Mario Kart Wii came out in 2008 as well. It was a pretty good day for games. This week in Your Parents Basement, we are doing our best to survive snake bites, drowning, snake bites, cholera, snake bites, dysentery and snake bites! Originally released in 1971, and with many good re-releases culminating in a second installment in 1996, we’re playing The Oregon Trail and The Oregon Trail II! You can manually download this week’s rugged podcast here, or subscribe to the show via the iTunes store. To manually subscribe, use this link in the device / podcast player of choice. You can also follow us on Twitter, or ‘like’ us on Facebook. 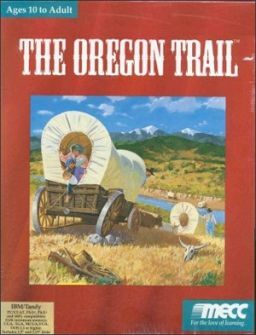 0:00 – Intro, which is the main traveling theme from The Oregon Trail II. It varies depending on the condition of your group. 49:45 – Brisket has a new game that’s already sweeping the nation, getting fanfare and triumphant applause. It’s Abobo Adobo! 58:30 – Emails. We hear from an old friend, and talk about our favorite Mario accessories. – Brisket’s Twitch account is available here, where you can see footage of him playing The Oregon Trail II and past YPB games. – As mentioned on the show, you can play The Oregon Trail and its various incarnations online for free nowadays. If you’re looking for a specific hard copy, the price tends to range from $3.50 to $10 for the game itself. If you want the box and manuals, it ranges from $4 to $22, according to Price Charting. – Rare has made a ton of games. Wikipedia has the full list here.